Getting outdoors and into nature is crucial for understanding our place in the world and the role of nature in supporting all life on Earth. With the exponential increase in technological and screen-based communication and entertainment, being outside in nature can be an antidote for the side-effects of too much technology. The Warrior Institute understands that the river is a lifeline of our people, as rivers have been throughout the world in many cultures. Water is life, and rivers flow with the lifeblood of our planet. The aim of Warrior Institute’s River Program is provide youth the training, skills, and education necessary to strengthen our cultural identity as River People. That will empower our youth to fight for environmental justice and to become fishermen, traditional paddlers, river scientists, river restorationists, and river guides. Healthy watersheds are vital to our communities and our planet. Our aim is to restore water, fishing, and traditional practices on the water, while also incorporating the best that the modern world has to offer. In order to maintain a healthy river the entire watershed must be understood and in balance. We provide youth training, skills, and education to strengthen the relationship with our rivers and engage youth with our watersheds. Youth will be educated about watershed science and conservation, both traditional ecological knowledge and modern disciplines. Youth will be empowered to advocate for the restoration of water and fish. By providing a resource of traditional tribal experiences combined with effective education techniques our students are learning how to combine traditional values and skills with today’s demand to obtain a complete education. A centerpiece of our River Program is our RiverWays curriculum that focuses on river boating trips and skills featuring traditional dugout canoes and state-of-the-art whitewater rafts. For many youth, coming of age can be a difficult time to test boundaries and seek thrills, which in the context of modern cultural dysfunction often leads to dangerous and self-destructive behaviors, drugs, and alcohol. The excitement and challenge of rafting difficult whitewater rapids provides a safe and healthy way to seek thrill and prove oneself. In addition, navigating the river requires teamwork and provides a bonding experience that brings people together and inspires youth to participate in other Warrior Institute programs. All of this comes together in a crowning jewel when we do our multi-day self support rafting trips, which provides a powerful mobile classroom and provides memories that last lifetime. Once our youth participants show an aptitude for river trips, we offer the empowering option of completing a professional river guide training course. This multi-day course trains participants in every aspect of river guiding and set them up to be competent guides that in turn, can guide our youth and participants on the river. Once a river guide, they can qualify to participate in our competitive rafting team, the River Warriors, which competes in the Class V National Rafting Championship. As the first Native rafting team, we aspire to one day win the Championship and represent the USA in the International World Cup of Rafting. Competitive paddling racing has been used to revitalize traditional paddling among the Hawaiian and Maoris, and is slowly starting to occur in North America. Despite being in the heart of salmon country and fishing Tribes, many youth do not have enough opportunities to learn to fish and process salmon. 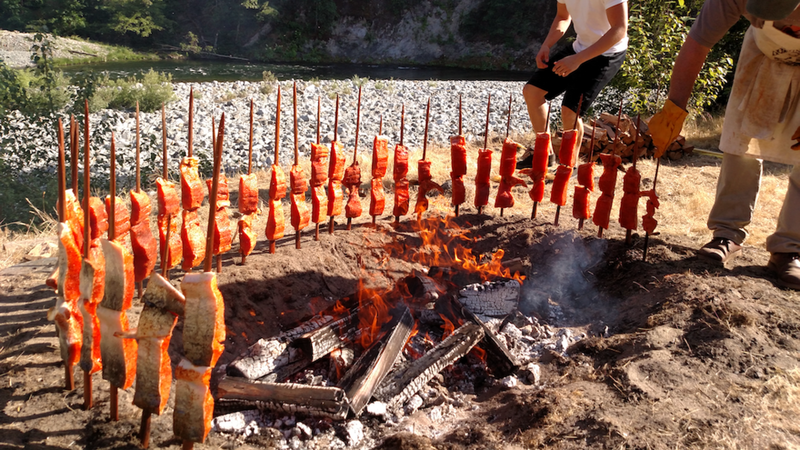 As part of the River Program and RiverWays, we include rafting trips specifically to fish and teach the arts of processing and smoking salmon. This includes proper etiquette and river stewardship, and the process of fishing from start to finish, from mending nets to bring fish to elders. Nothing can compare to the sense of pride and accomplishment when a youth bring home a salmon that they caught to feed their family! Our ancestors went to the high country to gather and pray, and looked to the high mountains for inspiration. The goal of our Mountain Program is to get youth back into the high country for these same reasons. As part of our Mountain Program, we offer backpacking trips, mountaineering, mountain biking rides, and rock climbing. Within our Mountain Ways curriculum we focus on stewardship, trail maintenance, fire ecology, and backcountry safety. Our Mountain Program plays a central role in our Rites of Passage. Our proposed Ocean Program will include traditional paddling as well as surfing and marine stewardship.